It was 6:00 a. m. and I was heading out to the shores of the Crooked Tree Lagoon. The lagoon was a fraction of what it had been a few months ago. Crooked Tree Village was in the middle of a long dry season. Crooked Tree Village is well known for its abundance of fish in its six lagoons. Several years ago, a number of tilapia entered the lagoons from nearby fish ponds and there were many fears from marine biologists of an ecological disaster. Some of the villagers feared that the aggressive tilapia they had heard so much about would wipe out the native species and would endanger the livelihood of the local fishermen. According to Ecologists, the tilapia originated in Africa and is a very popular fish with commercial growers. The reason the tilapia is so popular is because it grows rapidly and breeds constantly. Some researchers think that the tilapia poses a threat to fresh waterways. 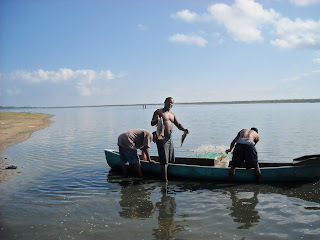 Fishing and hunting in and around the lagoons in the dry season is done on a quota system and only local fishermen are allowed. On Wednesday’s and Saturday’s each fisherman is permitted only two hauls with their nets between the hours of 7:00 a. m. to 11:00 a.m. and a mandatory fee of BZ$50 is charged. Any fisherman caught violating the rules risks having his or her nets and all equipment confiscated. 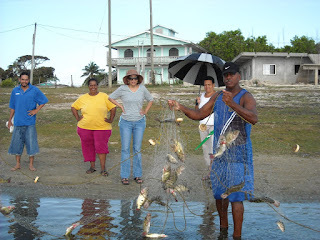 The Village Council, the Concern Citizen Group, the Ministry of Agriculture and Fisheries, and the Belize Audubon Society are responsible for the management of the fish in the Crooked Tree Lagoon and have implemented the “Catch Share” system. Catch Share is an incentive based management of fishing developed by the Environmental Defense Fund. Catch shares are used to manage fisheries all over the world. So far, there are about 40 countries with eight hundred different fisheries managed under the system. The way catch shares works is by giving fishermen, boats and fishing groups in the community a secure share of the catch for the season. Each year before the season begins; fishermen in the community know how much fish they are allowed to take of the fisheries total allowable catch. By implementing this system, fishermen will be able to take care of fishery in a sustainable way and be able to manage the lagoons for the community instead of people coming from outside the community to take out the last of the fish. The Village Council and the Concern Citizen Group work with the fishermen directly to understand their needs and to arrive at a solution that works for both teams. The fishermen in Crooked Tree Village and the Fishery Department agree that catch share is the best way forward for the village’s fishermen. The Village Council and the Concern Citizens Group worked diligently and constructively to set the fisherman on the right track. Working together using catch share is the solution to overfishing, to protect the lagoon and bring back fish stock to abundance. With the right choices, we can all enjoy abundant wild “Bay Snook”. As Denvor Gillett, succinctly puts it, “we cannot continue to exploit without management”. Goodness,I wish I was in CT eating some fresh fish right now. I like the looks of those fish. Some fried fish and fry jacks would be good right now since I have been sick for a few days and haven't had an appetite for anything. You look good too! Linda, I love this site. Thanks for teaching us about so many things in Crooked Tree Village.I like the different issues you bring up about our people and what's affecting our village. It is like my home away from CTV!